Richly illustrated with often antic images from alphabet books and primers, The Story of A relates the history of the alphabet as a genre of text for children and of alphabetization as a social practice in America, from early modern reading primers to the literature of the American Renaissance.Offering a poetics of alphabetization and explicating the alphabet's tropes and rhetorical strategies, the author demonstrates the far-reaching cultural power of such apparently neutral statements as "A is for apple." The new market for children's books in the eighteenth century established for the "republic of ABC" a cultural potency equivalent to its high-culture counterpart, the "republic of letters," while shaping its child-readers into consumers. As a central rite of socialization, alphabetization schooled children to conflicting expectations, as well as to changing models of authority, understandings of the world, and uses of literature.In the nineteenth century, literacy became a crucial aspect of American middle-class personality and subjectivity. Furnishing the readers and writers needed for a national literature, the alphabetization of America between 1800 and 1850 informed the sentimental-reform novel as well as the self-consciously aesthetic novel of the 1850s. 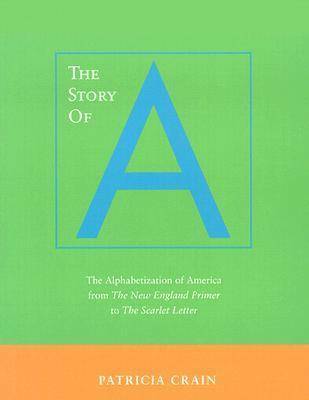 Through readings of conduct manuals, reading primers, and a sentimental bestseller, the author shows how the alphabet became embedded in a maternal narrative, which organized the world through domestic affections.Nathaniel Hawthorne, by contrast, insisted on the artificiality of the alphabet and its practices in his antimimetic, hermetic The Scarlet Letter, with its insistent focus on the letter A. By understanding this novel as part of the network of alphabetization, The Story of A accounts for its uniquely persistent cultural role. The author concludes, in an epilogue, with a reading of postmodern alphabets and their implications for the future of literacy.